Welcome to another post for the Craft Café! 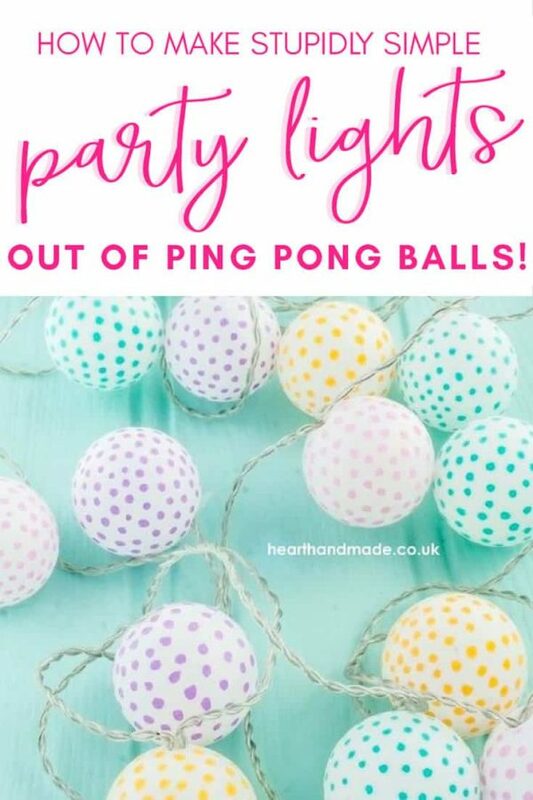 I’ve been working on these polka dot ping-pong lights after discovering that it’s near impossible to find festoon style lighting here in the UK within my budget! They cost an absolute fortune, so of course, I had to make my own! My lights ended up being blue-white instead of warm white; luckily this was a really simple DIY project so when I get some warm white battery operated lights it will be easy to move the balls over. 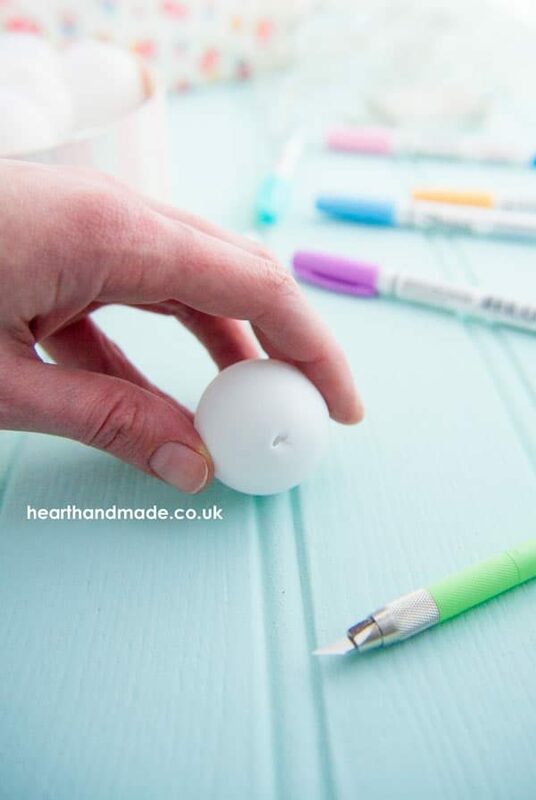 I took each Ping-Pong ball and used a sharp craft knife to mark an X on the ping-pong ball. I almost lost a finger! 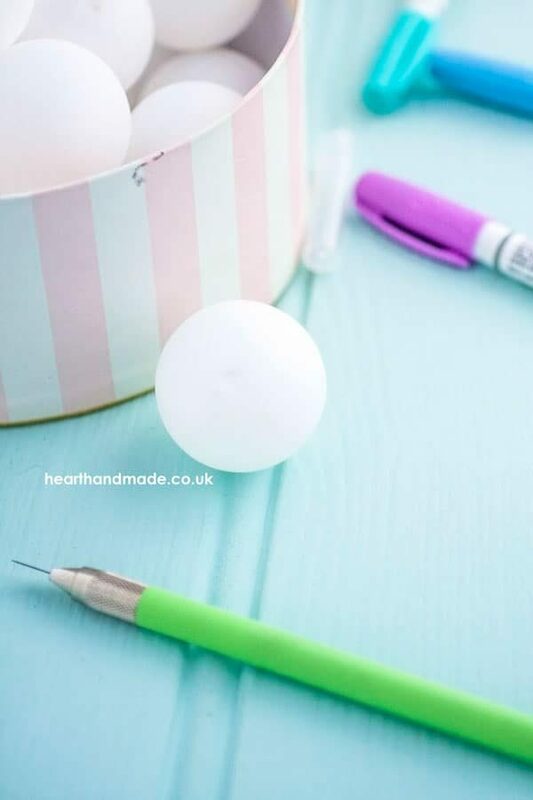 If you look on the ping-pong ball, you might see a little join where the two halves of the ball were fused together in production, just beside the join seems to be the weakest part of the ball and the easiest to poke your knife through. You can stick your pencil (nib first) into a little hole made from your X. 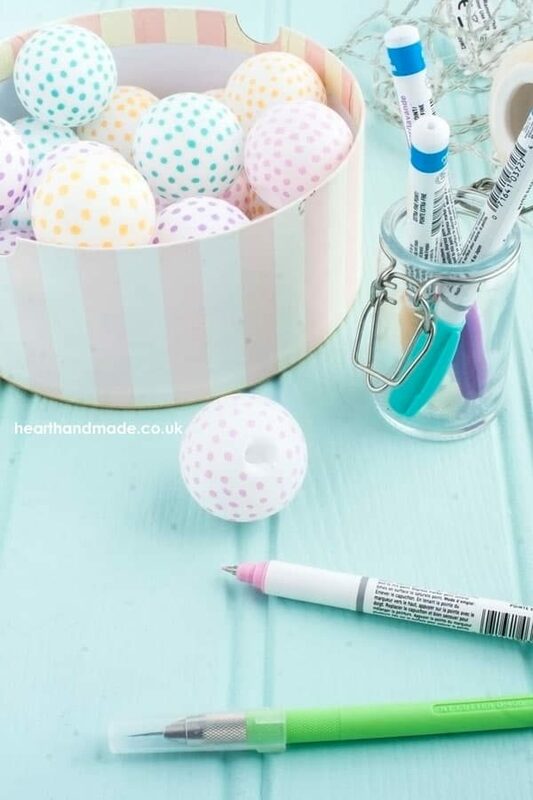 Start painting your polka dots! You can use ring binder reinforcing stickers as a stencil, but those circles were huge and I wanted little polka dots. 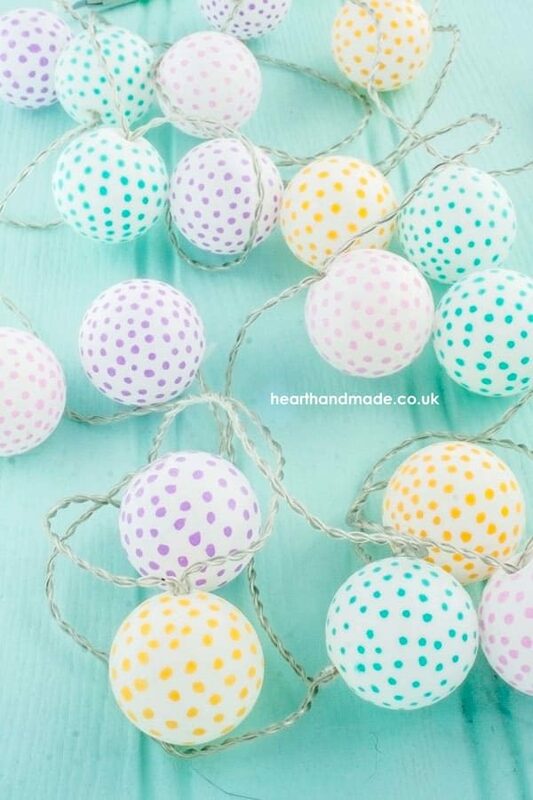 Allow to dry, just pop the polka dot Ping-Pong balls onto your lights and hang wherever you like and enjoy your gorgeous Festoon style lights! poke the lights into the ping pong balls et Voila! Ohhh love it!!!! 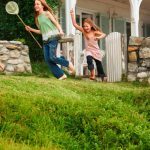 great idea and great DIY! Thanks!!! thank you so much Ayda! This really is a great idea!! I might try this… It’s so simple and lovely. This is such a lovely idea Claire, and it’s so creative. Something to try myself one day. Thank you! Great tutorial! Where did you get the ping pong balls? Are they special ones or just regular ping pong balls? they’re just regular ping pong balls! Great idea for lighting but make sure that you use LED bulbs as you don’t want the ping pong balls setting on fire. Very cute! I love the polka dot ping pong balls and using multiple colors on a strand. Great idea! Thanks for sharing! Love this, such a creative idea! 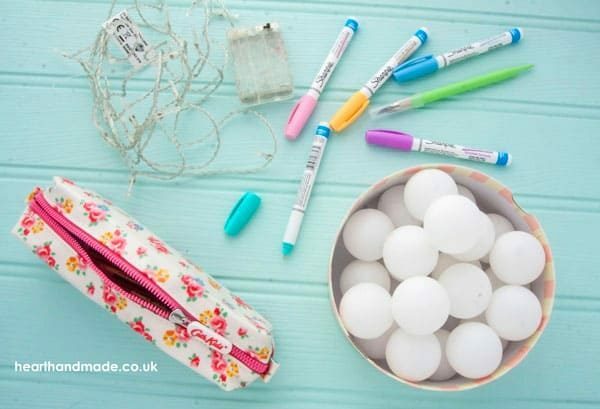 I have a string of white lights…now I need to get some ping pong balls – this will look super cute hanging in my craft room. I’d love for you to stop by and share this at the Creative Inspiration link party! What a clever idea. I love this idea. I just need to get some ping pong balls. 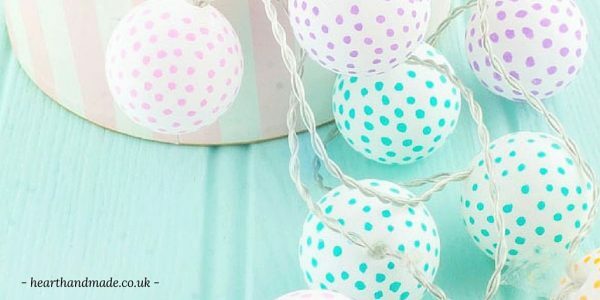 These polka dot party lights are so pretty! I would love them for my daughters birthday. Pinning them. Found from Treasure Box Tuesday. Ping pong balls! Who knew! These are so incredibly cute. Stop by my linky party to share every Saturday night at 8PM CST. Love them! They would look so cute at a little girls tea party birthday. Or just hanging on the pergola in the backyard for summer ambiance. So cute! I’ve seen the ping pong balls on lights before, but never with polka-dots. Love it! Thanks for sharing your idea! These are adorable. I have been looking for lighting but it is dang spendy! I am so trying this. Thanks so much! This is a genius idea & so cute! I’m visiting from the Weekend Re-Treat Link Party. This is such a cute creative idea! Not to mention its something little kiddos could help do! Love this! They look marvellous for me. I’m going to look for white ping pong balls and I’ll try to do it myself.